As I sat on the step at Marge and Tedin’s house and watched the birds (mostly Pine Siskins and Common Redpolls), they seemed to get fairly comfortable with me. The Pine Siskins were the first to get close, but eventually some Common Redpolls also seemed to loose their concern. Several birds came within inches of where I was sitting. However, if I made anything other than very slow movements, the nearest birds would tend to scatter. After sitting and watching for quite some time as the birds actively fed, there was a sudden flight of birds from the side of the house. They were almost immediately joined by most of the birds near where I was sitting in front of the house. Every few moments after that, a few more birds would swiftly fly out until they were all gone. At the same time as the finches were fleeing, the juncos disappeared. I later figured out that they went deeper in the brush and stood still. There were still a couple of chickadees that seemed at least a little active in a tree by the corner of the house, but they were not leaving the tree. The way the birds suddenly made a rapid, direct flight away from the house, I figured something was back there. I thought it might be a squirrel that I had seen the last time I was here, but they hadn’t responded to the squirrel like that before. I looked around, but did not see anything, so I sat back down on the step and waited. While I was waiting, I happened to look up and see several crows in the trees on the other side of the house from where all the birds had taken off. Shortly after I noticed them, I saw them all swoop down together. I got the impression that they might be chasing something, but I did not see what it might be. By this time I was thinking there might be a small raptor of some sort around and maybe the crows were chasing it. I reasoned that if this was correct, maybe the raptor was now gone and the small birds would come back. In fact, this did seem to happen a little bit. I think most of the finches had left the area, but a few did come back, and some juncos appeared at the edges of the brush. Not too long after the birds started tenatively feeding again, I heard the a chickadee in the tree by the corner of the house make a call that seemed to clear the rest of the birds out again. There were not so many this time that it was an obvious flight, but the juncos disappeared and what few siskins and redpolls that had returned flew away. Moments later, I caught the flash of a bird flying in from over the house and landing in the trees at the far edge of the yard in front of the house. I only got a glimpse and was not sure what the bird was, but I suspected a raptor. I was able to locate the bird as it flew from branch to branch, eventually landing in the top of a tree. 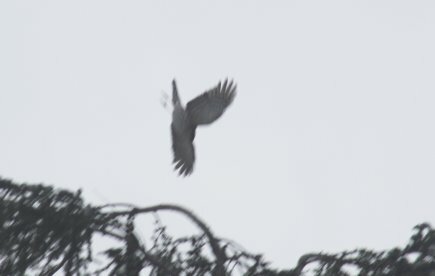 It gave half-hearted chase to a couple of birds while I watched and then flew back to the large alders on the side of the house. From there it flew back behind the house and I did not see it come back. 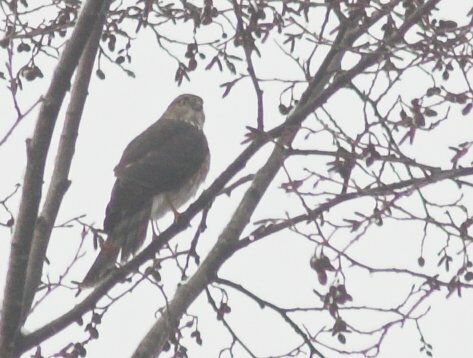 As far as I could tell, it was a first-year Sharp-shinned Hawk. After it seemed the hawk had left the area, I went back to the step to watch for a little while longer. This time the juncos were far less hesitant in their return to feeding and quite a few more siskins and redpolls returned. Apparently they had decided the danger was largely over with for the time. It would have been nice if the light was better and the focus was actually correct, but I still find this photo interesting as a look at how this bird took off. It had been perched on the branch that appears to be right below it. Instead of taking off like I am used to seeing most birds do, it seemed leap into the air and then enter this swan-dive downward for a short distance before leveling off. This entry was posted in birds, photo. Bookmark the permalink.